Where did all the power go—not just in the Methodists—but in the entire Protestant church in the West? The power is only available to those who follow Christ, even to Calvary. The power belongs to those who “die” and rise with Christ to walk in New Covenant resurrection life, spreading a New Covenant Kingdom! I’m convinced the Western Church has lost its power because it’s following the wrong leaders, cluttered with errant Old Testament (and wrongly interpreted New Covenant) teachings, splintered into too many factions—each of which is focused more on self-preservation than on the Lord Jesus Christ. I choose books like this to read because I want to understand what it is that has robbed the church of power. I want to understand what needs to change—in the church and in me—in order to experience a Greater Awakening. A wondrous new explosion of Kingdom growth is at hand. Like a tidal wave, it is starting out small, barely noticeable. Soon it will sweep the nations. But first, some things must change. “Revival”, sought devoutly in prayer meetings and council meetings, has been down-sized in meaning to, “Oh, God, send the sinners here to these pews! Anoint our preacher, and move hearts and restore our nation’s former glory. Let there be scores of ‘decisions for Christ’! Pour the fire of Pentecost on us and fill us with the Holy Ghost!” And then what? Build a bigger church building and tell the people they’re sinners, but God loves them…invite them to re-commit their lives to Christ every time they “backslide” (with every head bowed and every eye closed, of course)? Why do we think God would give us souls to steer when we’ve been such poor stewards of the Kingdom—stewards who are good at staging worship, creating programs and having “fellowship” suppers, but who have failed to make disciples? Church folks…dear brothers and sisters…you can fast and pray for revival—your concept of it—until the cows come home, but God is NOT going to pour the new wine of a new Greater Awakening into old wineskins. God cannot restore the power that comes from following Christ to a people who are willing to follow human leaders who get between them and Christ, or to “leaders” who usurp the Headship of Christ. Until we get the follower part right, “revival” isn’t going to come. God isn’t refusing to answer our prayers for revival. He is not slow to answer His followers. Maybe we’ve simply been praying the wrong prayers with the wrong motivation! This book certainly stands apart from all the “how to be a better leader so you can build a better church” volumes that line the bookshelves of pastors and ministers all over Western Christendom! (Hello…didn’t Jesus say HE will build His Church?) For decades we’ve put our faith in leadership paradigms and watched a steady decline in church attendance and membership. I pray this book will find an audience in all those who have ever sought to lead others—especially in the churches like Leonard Sweet’s own denomination (the one in which I was born and raised)—the United Methodist Church—in which the “laity” play as important a role in “leadership” as the “ordained” clergy. If deconstruction of the myths surrounding church leadership has ever been needed, that time is now, when the culture of the 21st century is young, but clearlydifferent from the modern culture in which evangelicalism came of age. This book calls the church back to something that was clearly understood in the first century. Being a Christian means being a first follower of Christ. Many prominent voices of Christendom today obsess about the eschatological “signs of the times”. Others center their existence around Salvation or the Great Commission. Still others wrangle over the issues of hell, social justice, and being “missional”. Leonard Sweet offers a work that pushes EVERYTHING else off the table…at least while you engage in the reading of it. I Am a Follower: The Way, the Truth and the Life of Following Jesus joins the ranks alongside other books heralding a new work of God that begins with a fresh unveiling of the Lord Jesus in all His sovereignty, supremacy, centrality, and glory. 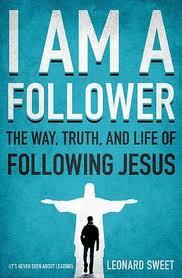 This book puts Jesus Christ front and center, and makes all the rest of us His followers. Isn’t that the way the faith started in the beginning? But where Len might surprise some readers—being, after all, an ordained member of the “clergy class”—he pinpoints where we are on this journey. “The Priesthood of the Leasthood” reads the chapter heading. Paine’s words can be quoted from the halls of government to the boardroom. But…do these words apply to the church? Every time I have heard them come from the mouth of a preacher or lay leader, it has made me cringe. The implications such an exhortation holds for the Body of Christ are that some are elevated in value over others, and if you’re not on board with the “leadership vision” you can leave. And I’ve seen those implications play out in settings where one or a few “lord it over” the rest of a congregation—with flagrant disregard to the Master’s instruction that his disciples not “lord it over” one another. Whatever position one may hold that can be labeled a “leadership” role, this book will threaten and strip away all human pretensions of being “a leader for God.” Throughout the book, Sweet will assign the word Leader to Jesus and Jesus alone. From the point where you encounter these two categorical imperatives, you will be forced to read from the standpoint of a follower until you are thoroughly comfortable with it and want more than anything you’ve ever wanted to be simply a follower—a first follower—of Jesus Christ. Sweet swings out on the limb—the one under which few who style themselves “leaders” will be willing to stand and catch him if he falls—to cry against the shepherds who have scattered the sheep. Calling for a “follower re-formation” to counter the Reformation’s failure in truly liberating the “Priesthood of All Believers”, he assaults the bulwark of the clergy/laity divide. And this merely sets the stage for a full frontal assault on the entire leadership paradigm of the Western Church that climaxes with, “The disciples were instructed to feed the sheep, not lead them. Christ will lead them. Jesus is the Shepherd. We are the sheep. All of us.”[v] Oh, the “amens” are sounding. If you didn’t hear them when you just read that quote, my guess is you’re a pastor and my question is: do you have the courage to read this book? Can you imagine yourself as a wayfarer—following Jesus on the Way? How big a thrill would it be for you to cast a wayfarer’s fruit into a dying world? Sweet shares snapshots of the wayfaring life. Can you imagine yourself walking in the power available to a follower? Can you imagine yourself really taking up the cross? Whatever opinions his critics–those who have labeled him a “New Ager”–have held in the past about Len Sweet’s language when he speaks of an indwelling Christ, the premise that you have the power of the Son of God living in you is entirely orthodox, and Leonard Sweet is a Spirit-led follower. I paid the full purchase price (including state and local sales tax) for this book at a bookstore. I did not receive compensation, in any form, for writing this book review. I was not influenced to write a “positive” review by any means other than the persuasive resonance of the author’s “voice”. Author’s note: I’ve left an important message to readers in the first comment following this book review. Please take time to read it. And please click the share button if this review sparks an interest in this book. « Are You Being Prepared to Burn for Something Good? Author’s note: I welcome the opportunity to review this book, not only because it deserves (and ought) to be read by every follower of Christ, but also because it presents an opportunity to weigh in on a matter that deeply concerns me. Some “Christians” have written some mean and nasty things about Leonard Sweet on the Internet. He has answered their accusations himself (without naming names) on his own site. He’s been called a lot of things. TELLINGLY—you won’t find one thing he’s written that’s mean and nasty about anyone else. I have read enough of Len Sweet to know he affirms the Apostle’s Creed. I can’t hold a fellow-follower to a higher standard of orthodoxy than that. We do not all use the same “spiritual conversation style”; and we do not all have to agree on non-salvation issues. Len Sweet says, “Jesus is Lord”, and that is good enough for me. He is “in Christ” and part of the Body of Christ. “The Bible defines slander as accusatory speech that is injurious to a person’s name and reputation. It’s essentially character assassination . . . the act of smearing someone. Gossip and slander color people’s perceptions of an individual unfairly and unjustly without their knowledge or consent. One major component in both of these sins is that the person being torn down is out of the loop. Talebearers usually avoid speaking directly to the one they are demeaning.” __Jon Zens (http://searchingtogether.org/articles/gossip.htm) Don’t believe everything you read on the Internet…especially when a Christian is saying mean and nasty things about a brother in Christ.